It began with Eragon ...It ends with Inheritance. Not so very long ago, Eragon - Shadeslayer, Dragon Rider - was nothing more than a poor farm boy, and his dragon, Saphira, only a blue stone in the forest. Now, the fate of an entire civilization rests on their shoulders. Long months of training and battle have brought victories and hope, but they have also brought heartbreaking loss. And still the real battle lies ahead: they must confront Galbatorix. When they do, they will have to be strong enough to defeat him. And if they cannot, no one can. There will be no second chances. The Rider and his dragon have come farther than anyone dared to hope. But can they topple the evil king and restore justice to Alagaesia? And if so, at what cost? 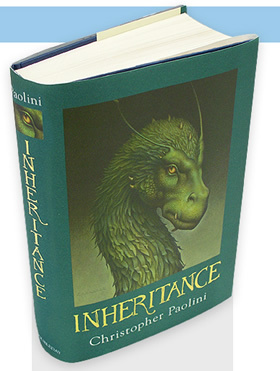 Featuring spectacular artwork by cult artist John Jude Palencar, this stunning book brings the bestselling Inheritance cycle to a breathtaking conclusion. Christopher Paolini was educated at home by his parents. His abiding love of fantasy and science fiction inspired him to begin writing his debut novel, Eragon, when he graduated from high school at fifteen. He became a New York Times bestselling author at nineteen and continued the Inheritance cycle with Eldest and Brisingr. Christopher lives in Montana, USA, where the dramatic landscape fed his vision of Alagaesia.